Julie Anderson feels a need to find the man she fell deeply in love with during her youth. When Julie went off to college to become a lawyer, she lost contact with her high school sweetheart. She now wants to know what became of Joey, and why he stopped writing to her. This is an assignment that intrigues Amelia. The thought of finding a long-lost love seems quite romantic. 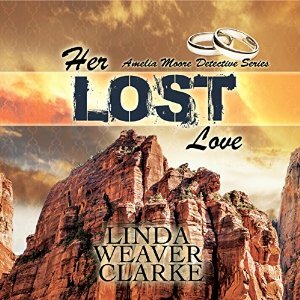 Hunting down someone's lost love is a journey of love for Amelia. She is still in the early stages of love with her business partner Rick, and the uncertainties she has for commitment are explored as the mystery unfolds. It felt like the stakes were lowered a little in favour for exploring the romance between the detectives...at least that's what I thought until the end which had me holding my breath then laughing at the outcome. I prefer action to romance, but understand that Amelia and Rick are still getting to know each other and a lot of readers like romance. Even knowimg what I do from finishing the book, there's no doubt that Amelia is holding a lot of information about her upbringing which I hope will be divulged over the next few books (I know this series is long-yippee!). I love seeing her confidence as a detective grow, especially when it comes to dealing with secret service workers, who had me intrigued and made me laugh a lot. Together Amelia and Rick have to constantly try and outsmart them so they can proceed with their case. Admittedly it's probably my least favourite book in the series, but as you can see from the grade I still really enjoyed it. I love the familiarity of Rick and Amelia, love knowin that danger will eventually come, that there will be plot twists I guessed both correctly and incorrectly. It is overall a feel good read, one which I'm looking forward to returning to some day. Find out more on Linda's website.